The crosscut sled is a fantastic addition to your workshop and is a favorite of the Wood Craftsman. 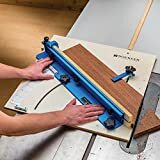 It provides you with a basic and simple crosscut sled, attaching to your table saw with the advantages of an adjustable stop block and a measuring tape. Making repeated cuts simple and easy task. The position of the runners and the size of the sled can be adjusted to fit any table saw you might like to attach it to. What Is A Crosscut Sled With Adjustable Stop Block? What Is the Crosscut Sled Used For? Keep reading to learn how the crosscut sled can add value to your workshop and transform your table saw into a versatile tool capable of being custom tailored to your wood crafting needs. The crosscut sled with an adjustable block is a custom-tailored wood crafting tool that attaches to your table saw to enable you to make custom cuts with precision. The crosscut sled has a built-in tape measure and an adjustable stop block for further ease of use. Once customized to your table saw, the crosscut sled attaches to your table saw to make custom-cutting simple and fast. The crosscut sled is a solution you can make yourself through wood working that will enable you to produce your future projects with ease through an easy to use custom-measuring wood cutting table saw attachment. It attaches to enable you to cut unique pieces of wood at various angles through the firm attachment of wood and an exceedingly safe process of operation. To build your very own crosscut sled the Wood Craftsman way, you will need the following pieces of wood, your choice on the tree from which it's taken. A dark oak or cherry would look outstanding. However, it is your choice on what to use, keep in mind, harder wood should be used, especially for the runners given the additional weight and functionality they are exposed to. 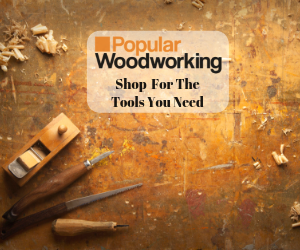 You will also need a circular saw, and a table saw, in addition to a band saw, should you prefer customization. 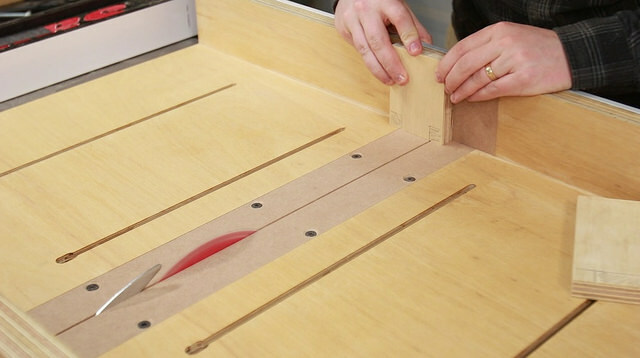 Getting together your own cross cut sled is a fun project that clicks together like a puzzle. Each individual piece is sculpted down into the appropriate size and dimensions, with the option to add angles for weight reduction and style increases. The following steps are necessary along with insider tips to make sure your project moves as smoothly as the sled will alongside your table saw when we're done. To get the main board down to the requisite dimensions, we will be using the circular saw. For the fence boards, the table saw is the best option to use. A band saw will come in handy if you decide to go the extra mile. Once you've gotten your main board, fence boards, and runners together, it's time to get to connecting the pieces together, but first, we'll move through how each piece is cut and constructed. Keep in mind, the runners above all other pieces will be experiencing the most stress over time, so make sure not to use soft wood for them. The pieces for the runners should fit nicely, however, make sure not to fit it too tight; they might need to be readjusted later on. It's a good idea to cut them slightly too large, allowing you to sand them down to the perfect size during final assembly. The runners are placed in the spaces in the table saw, the main board is placed on top, and we then adjust it to the proper position. We then mark out on the main board in the front and back where we'll be placing the runners. The fence is best built around an inch, so depending upon the wood you're using we'll be using either two or four pieces for the fence as we might double the up if the wood is 1/2 inch. If you'll be doubling up, clamp the sides and nail them together. For added flair and to lessen the weight of the sled, you could add a little curve to the back fence. To do this, we measure out two points, place a flexible ruler between the two, and draw on a pleasant curve. The excess is then cut away with the band saw should you have opted to get one together for this project. With the pieces cut, the fence can now come together, with the curved back first being glued and stapled into place, and further secured through the use of screws. The front piece of the fence will be riding on top of the saw, and so it must be entirely straight in relation to the blade so it can be easily and flexibly adjusted. To secure the front fence first countersink so that no screws are protruding, then secure it with the screws. In the next step, we begin by pre-drilling runner holes along the line where it will be secured. It's a good idea to draw the line on with a pencil and ruler prior to pre-drilling the holes to ensure they line up. The runners are then placed in the table saw, glue is added, and the sled is carefully placed on top and screwed down through the pre-drilled holes. Before starting, make sure the blade is positioned straight at 90 degrees. Upon having done so, it's time to make the first cut down through the front fence. It is important the fence remains at 90 degrees in relation to the blade, and if necessary, screw it in place at the appropriate measurement to keep it consistent and straight. We now use the blade to cut through the front fence. 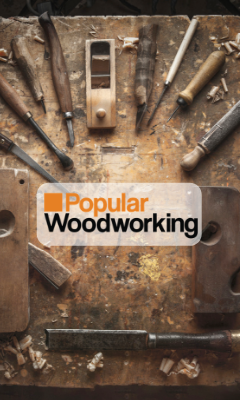 When working on any project, it is important to make sure that safety is kept at the forefront of our minds, as one injury can end a life of quality woodworking fun. To provide protection against the blade, we can secure a block of wood into the back of the fence so the blade cannot stick out on the other side. Whatever wood works as long as it is chunky, which we then clamp and screw into place. Now that we've gotten the pieces cut and together for the sled, we can add the final stylish flair to our craftsmanship. To provide protection against everyday wear and tear as well as mother nature, it helps to add some protective finish. A de-waxed shellac works nicely. On the underside, a mineral oil wax polish can be added on the runner and over the entire board. This extra step helps ensure that the sled has a smooth slide atop the sled. In order to add the adjustable stop block, we position the sled hanging down with the front fence leaned upon the surface. To keep it steady and stable we'll place a scrap piece of material underneath, and screw or clamp it into place. With a router and a 1/2 inch bit, route a section on the right side of the blade in sections, lowering the blade just a small amount each time. For the stop block we'll cut a piece of plywood in a smaller section, marking out where the routed hole is on the fence, then we'll drill a hole through. Through the hole, we'll add a bolt and a knob on to the other side to keep the block secured in place. What's a customizable crosscut sled without accurate measurement? An incomplete project, but we're getting there right now. We'll first prepare the surface on the top of the front fence, and smooth it out with some planning if needed. We then secure a measuring tape on top with zero positioned at the cut, and we're ready to get to using our custom crosscut sled. 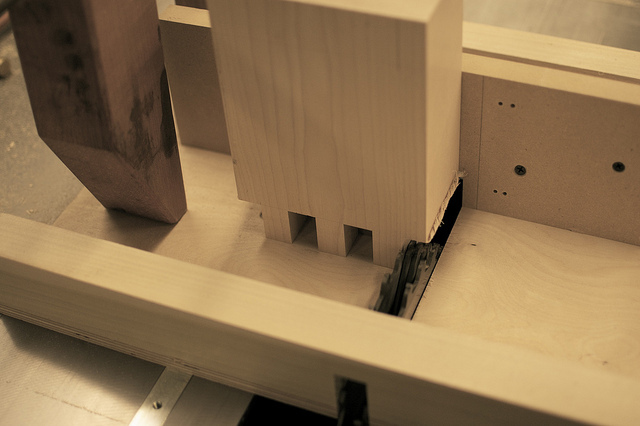 For further guidance refer to the video by Darbin Orvar on the construction of their own birch version of the crosscut sled with an adjustable stop block. 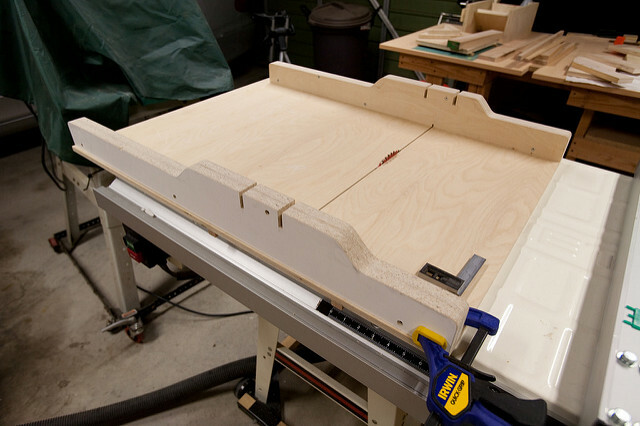 A crosscut sled is a versatile tool that adds a new dimension of customizability to your wood workshop. With the ability to safely and accurately measure and cut smaller pieces for your projects, the crosscut sled is a highly valuable tool. Check back with the Wood Craftsman to make comments and discuss your crosscut sled project, especially how you put it to use.